Subscribe: https://goo.gl/6zXZGK for 2 new videos every week. Warning: Don’t try this BBQ chicken method at home, unless you have a good fire-proof location – then it would be really cool to try. Som tam, gai yang, is the popular and widely available Thai food combination of green papaya salad and grilled chicken… but we wanted to do something and eat something out of the ordinary! Along with the help of Sonny from Best Ever Food Review Show, we ate some extraordinary versions of both grilled chicken and Thai green papaya salad, both not what you’d find at a typical restaurant. The chicken, a very traditional, rare to find style of cooking, and the green papaya salad, a little more extreme than others. Uncle Peen Baked Chicken (ไก่อบฟางลุงพิน) – It’s easily the most unique style of grilled, or more like baked or smoked, version of chicken I’ve seen in Thailand. 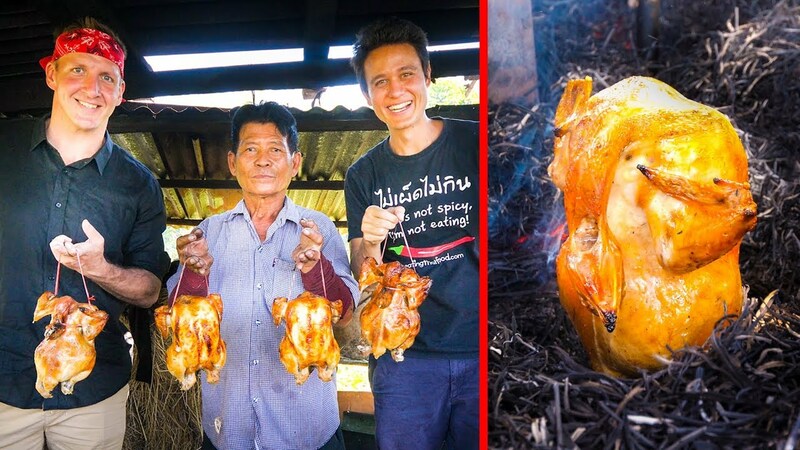 To make the hay smoked chicken (ไก่อบฟาง) uncle arranged the chickens on upright stakes, put oil drum lids over them, filled the trough with dry rice hay, and lit that on fire… twice. The result was one of the most juicy tender grilled chickens I’ve ever tasted. It was amazing. Som Tam Jay Gai (ส้มตำเจ้ไก่ ดอนเมือง) – Next to complete our combination of not your ordinary grilled chicken and green papaya salad we drove to Don Muang to eat at Som Tam Jay Gai (ส้มตำเจ้ไก่ ดอนเมือง), a restaurant originally from Udon Thani. There were so friendly there, and the main dish we ordered was tam code mua (ตำโครตมั่ว), the crazy spicy giant plate of green papaya salad with everything in it. We both suffered and cried tears of joy, but it was so much fun! Again, go check out Sonny (Best Ever Food Review Show): https://goo.gl/ugvUcy He produces amazing professional quality food travel videos.